When someone says “up-tempo offense,” I think of teams like Oregon, Baylor, and Texas A&M—the programs that revolutionized college football. 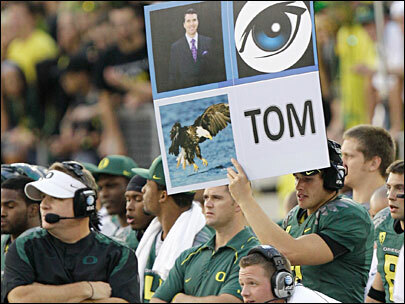 Guys like Chip Kelly and Art Briles served as the poster boys for a new kind of offense, a new brand of football. Out went the huddle and in came photo boards. Coaching staffs did whatever they could to speed up play calling. From 2008 to 2012, the average number of plays per game jumped from 67.6 to 71.5. The name of the game was not only scoring, but scoring fast. In 2012, Oregon, Baylor, and Texas A&M, cracked the top 15 in plays per game. Each was running upwards of 82 plays per contest. More snaps meant more points. By the end of the season, they featured three of the nation’s five highest-scoring offenses. Over the years, the change of pace has paid dividends, at least for these schools. Oregon booked a trip to its first BCS title game, Baylor quarterback Robert Griffin III won the Heisman Trophy, and Texas A&M finally crawled back into the national championship discussion. So when Boston College head coach Steve Addazio announced that the Eagles would be rolling out a high-octane offense of their own in 2017, it was only natural to think that they’d improve on the offensive side of the ball. Besides, BC entered the season with a four-star backfield and its best receivers in the past five years. Addazio prides himself with calling an average of 87.3 plays per game—19.5 more than BC ran last season and the the 10th most in the country. And the Eagles are throwing the ball more than they ever have. But when push comes to shove, the offense hasn’t changed one bit. So far, BC is averaging a mere 17.7 points per game—only half a point more than the team posted during its infamous 2015 season, and about a field goal less than it averaged last year. Yes, the Eagles are gaining more yards per contest than they did the year before, but that was to be expected. When you’re running more plays, you’re probably going to rack up more yards. But as we learned from Saturday’s loss, total offense is hardly indicative of a team’s performance. For the first time this season, BC recorded 400 yards of offense against Notre Dame. All day, the Eagles moved the ball methodically downfield. But, like their first two games of the season, BC hit a wall once they crossed midfield. Despite picking up 22 first downs, quarterback Anthony Brown and Co. couldn’t finish drives. If you look at the stat sheet, it’s not that hard to figure out why the offense stalled. BC ran 85 plays against the Irish. But each one averaged only 4.7 yards. As a team, the Eagles hovered around a season-high 4.2 yards per carry. That wasn’t the problem. Brown’s 5.1 yards per pass attempt was. The redshirt freshman tossed 41 passes for just 215 yards. A handful of his throws were out to the flat or within 10 yards of the line of scrimmage. When all was said and done, most of Brown’s passes were nothing more than glorified runs. All Notre Dame needed was crowd the box. Odds were that the ball wasn’t going more than five yards. Because of this dink and dunk play-calling, BC typically needed all three downs to move the chains. But converting on every third down is just outright ridiculous. Not even Alabama and Clemson can. It’s impossible. The Eagles reached third down 17 times on Saturday, and had to punt on eight separate occasions. This has been happening all season. After three games, BC is averaging just four yards per play, the 13th-lowest mark in all of college football. But hold on, it gets worse. The Eagles are also 103rd in the nation in yards per point and 112th in points per play. Neither the ground game or the passing attack can hit the big play. In fact, BC has picked up 30 or more yards on just one play all year—an end around to Thadd Smith against Wake Forest. To put that in perspective, in Saturday’s game alone, the Irish ran six rushing plays of over 30 yards. Even worse, the Eagles are averaging just over three 20-yard plays per game. As a result, the offense is left with a bunch of screens and power runs—the epitome of Addazio’s offenses in year’s past. BC has been faced with 19.3 third downs per game, the fifth-most in the country. And the Eagles are only converting 32.8 percent of the time, ranking them 96th in the nation in that department. Only four punters have booted more kicks than Mike Knoll this year. That in itself is telling. BC’s rattling off more plays and gaining more yards than previous years, but until it can move the sticks on first and second down, scoring will continue to be an ordeal. Addazio needs to risk it for the biscuit. Everyone in Alumni Stadium shouldn’t know what play is going to be called on first down. Instead, maybe use Brown’s arm and go 15-20 yards downfield on first. Then turn to run game on second. Anything to keep teams guessing. Because right now, BC’s offense is predictable—the antithesis of an up-tempo offense. The whole purpose of running more plays is to keep the opponent’s defense on edge. But if defenses already know that the Eagles are going to run the ball up the gut on first down or throw it to a wheeling running back three yards past the line of scrimmage, then what’s the point? During Monday’s press conference, the fifth-year coach conceded that his team needs to put more points on the board, but he applauded the offense on achieving what it set out to do this offseason. I would have thought the objective was to break out of the ACC’s cellar and make it back to a bowl, but hey that’s another story. Nevertheless, Addazio isn’t wrong here. The offense is certainly more balanced. But that doesn’t mean it’s more efficient. Brown is throwing the ball 41.3 times per game—the 15th most pass attempts in the nation and 18.3 more than Patrick Towles averaged in 2016. What is extraordinary, however, is the fact that he is averaging just 4.6 yards per attempt, seventh-lowest among FBS quarterbacks and lowest in the Power Five. It’s not like Brown doesn’t have an arm. The Cliffwood, N.J. native has showcased the ability to rocket the ball down field. Unfortunately, his receivers haven’t always helped him out. Drops have limited BC’s big-play ability and have created unnecessary turnovers, especially against Wake Forest. For whatever reason, whether it be the interceptions or the lopsided point differential, Addazio has been extremely cautious with his redshirt freshman signal caller. In each of the past two games, Addazio has pulled Brown before the game’s end. Potentially even more concerning is the way Addazio has changed his play calling in the two-minute drill. The turning point of the Eagles’ Week One victory over Northern Illinois occurred right before intermission. Instead of letting the Wolfpack run the clock out, up 10-6, Addazio called all of his timeouts, successively, following three-straight NIU rushing attempts. The Wolfpack punted, and Brown drove BC 50 yards downfield for a touchdown in just a minute and four seconds. A week later, the redshirt freshman was put in the same position. Down a touchdown to Wake Forest with a bit more than two minutes remaining in the first half, Brown was tasked with leading the offense into Demon Deacon territory. But on his first pass attempt of the drive, he threw a pick-six. So when the Eagles had the ball near midfield with two timeouts and 18 seconds left in the first half of Saturday’s game against Notre Dame, Addazio neglected to give Brown a shot. Instead, he ran the ball into the tackles, and took the locker room. After the game, he told the media that he didn’t want to compromise his young quarterback’s confidence. If anything, letting Brown air one out would help his psyche. Interception or not, it would have shown the kid that his coaching staff has faith in him. Saying that his chances of taking the snap, dropping back, and flinging the ball 45 yards downfield were low is what really could drain a quarterback’s confidence. Addazio needs to believe in Brown. He needs to believe in his offense. For the first time in years, BC has legitimate weapons: two four-star running backs, explosive slot receivers, big targets on the outside, and a pair of pass-catching tight ends. On paper, this unit should be scoring at least 25 points per game. But they’ll never get there if Addazio is conservative. Moving to the up-tempo offense was one of the best decisions Addazio has made at BC. If executed correctly, it is thrilling and potent. There’s a reason why Oregon is a fan favorite. Yeah, the uniforms help, but people are really drawn to the way Ducks play: fast and explosive. The Eagles have the fast thing down, but until they’re explosive, people won’t even know that they’re running an up-tempo offense. Good analysis – on top of that our up tempo offense is helping our defense to run out of gas prematurely. Daz should ditch the up tempo and keep our offense on the field longer. Let our QB catch his breath and be more deliberate.